"The Brentwood" Driveway Gate | Mulholland Security Los Angeles 1.800.562.5770 Here is the driveway version of our popular entry gate, teh Brentwood. New "Brentwood Entry" Gate | Mulholland Security Los Angeles 1.800.562.5770 A 3-gate installation beautiful wood and iron gate, "The Brentwood"
MANGARIS RED possesses the richness of Mahogany. 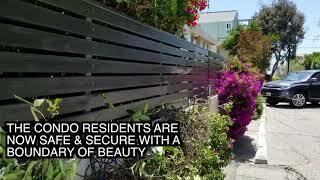 Residential Gate Installation Los Angeles, Securing your home & business. 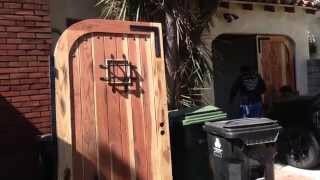 http://GatesLosAngeles.com In this video we givea tour of a gate and fence we just installed to protect this family's four children and also increase the security, privacy and beauty of the home. Mulholand Security centers Experts, Securing your home & business for a better Peace of mind! 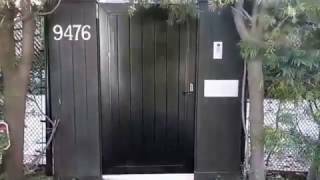 Security walk through, Gates & fences, door's hardware Specialist- Locksmith, Security Camera systems-CCTV, Access control, Intercoms, Home automation, alarm systems, alarm monitoring. And all security hardware systems integration! Here we help a customer get the exact style of gate, so that it matches the design of the house and his front door, all of which are familiar to Southern Californians as the Tuscany design. We are very pleased to help our clients with any design that they like. These are Tuscany styled gates that we installed in Los Angeles. In this project, careful consideration was made of the house, and particularly the front door. We wanted a look that fit nicely with the general appearance of the home. 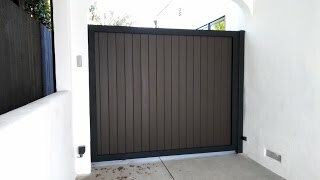 Beverly Hills Wood Gate Wood gate, crafted by Mulholland Security Centers, a solid metal frame. 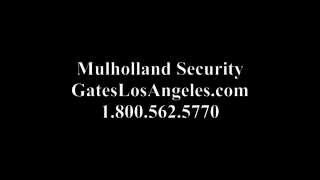 This has been cut to precision by an expert carpenter using a computerized sawing machine, and built upon a solid iron frame.by Mulholland Security Centers' Gates Los Angeles http://gateslosangeles.com/customer-testimonials, a division of Mulholland Security. Call is 24/7 for emergency service. 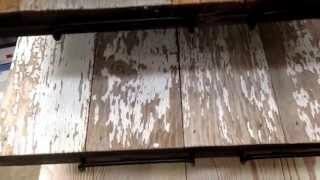 We are using reclaimed wood in a lot of our residential gate projects. Gates designed with such wood always has a very distinctive look to them. 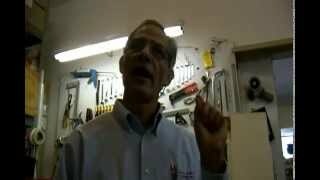 Mulholland Security / GATES / TITO learn how to get the right paint for your application. not all paint procesess are the same. 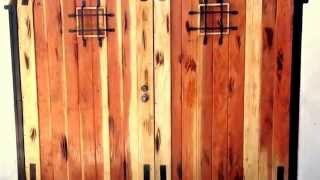 Wood Doors and Gates - Repair of Expensive Imported Gates Los Angeles We are happy to help! http://gateslosangeles.com/free-estimate.html. 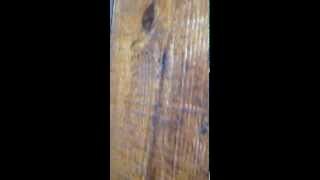 We explain why one must be informed and cautious in buying wood products. In time, wood will split, warp, or do other things that you might not want it to! This does not mean what you have is poor quality; it may mean that it needs some care and attention. We can help you with that! Painting a Fence Correctly Check our site at http://gateslosangeles.com/gates-and-fences/wood-gates and read our many testimonials. You can also reach us at 1-800-562-5700. We also have a 24/7 hotline. 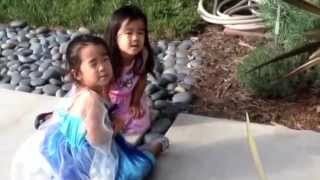 You should make sure your perimeter security is excellent for the welfare of your children. Many are installed with little consideration for the way the wood should be treated. 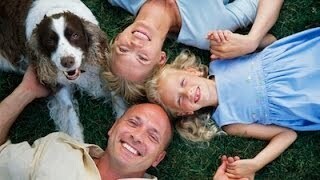 At Mulholland Security, our work is done with high value and great consideration to budget and objections. Mulholland Security Home Automation for a Mulholland Security client in Valley Village. Home Automation for a Mulholland Security client in Valley Village. See how the gate, light, locks, fire place and all can be controlled via any computer around the world.